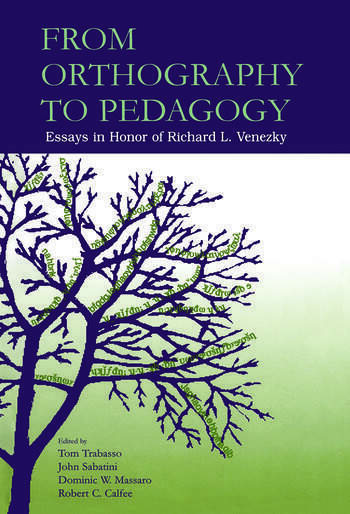 From Orthography to Pedagogy pays tribute to Richard L. Venezky's work and influence on reading, linguistics, and computer science. This book catalogs findings related to speech and language development, reading and spelling's role in infant speech development, and the present and future advances in the study and theory of speech and cognitive development. The editors focus on the role technology could play in development and advancement of literacy speech and reasoning. *influences of modern technology and multi-media. Representing a history of study in the field, this book appeals to anyone working in the area of language development, as well as those in related fields such as linguistics and developmental psychology. Contents: Preface. R.C. Calfee, The Exploration of English Orthography. R-M. Weber, Phonological Variation and Spelling. D.W. Massaro, A. Jesse, The Magic of Reading: Too Many Influences for Quick and Easy Explanations. K. Pence, R.M. Golinkoff, R.J. Brand, K. Hirsh-Pasek, When Actions Can't Speak for Themselves: How Might Infant-Directed Speech and Infant-Directed Action Influence Verb Learning? T. Trabasso, The Role of Causal Reasoning in Understanding Narratives. M.L. Kamil, D. Lane, E. Nicolls, Theory and Practice of Using Information Text for Beginning Reading Instruction. B. Öney, A.Y. Durgunoglu, Research and Theory Informing Instruction in Adult Literacy. J. Sabatini, What Does It Mean to Comprehend or Construct Meaning in Multimedia Environments: Thoughts on Cognitive and Assessment Construct Development. D. Mioduser, From Real Virtuality in Lascaux to Virtual Reality Today: Cognitive Processes With Cognitive Technologies. T. Shanahan, Gaining Perspective Through Science: A History of Research Synthesis in Reading. D.A. Wagner, Literacy and New Technologies: Ten Principles for Assisting the Poor. F.B. Murray, E.M. Stotko, Problematic and Promising Trends in Holding Teacher Education Programs Accountable. D.D. Johnson, B. Johnson, High-Stakes Testing: Literacy by the Numbers. D. Kaplan, X. Uribe-Zarain, Time Is of the Essence: An Overview of Quantitative Methodologies for the Study of Change. A. diPaolo Healey, The Dictionary of Old English: The Next Generation(s).